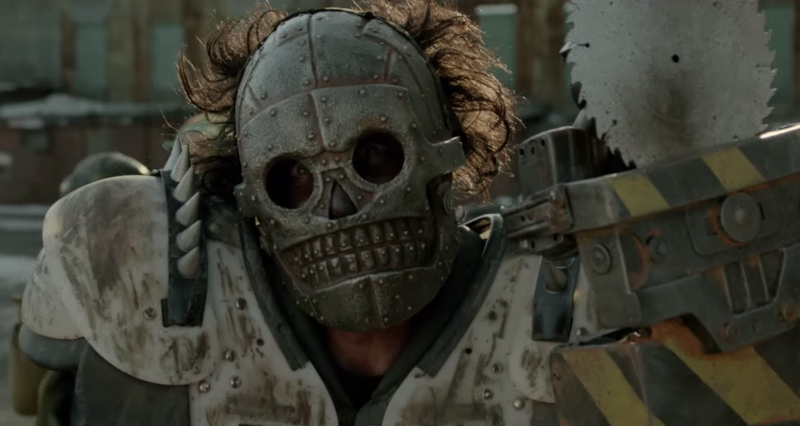 Of all the midnight films I saw while attending SXSW 2015, Turbo Kid remains the most unique title of the bunch. Part action film, part lo-fi comedy, and total throwback to everything wonderful about direct-to-VHS cinema of the 1980s, it’s a film like no other, and earlier today the film’s first trailer hit the net. Directed by Anouk Whissell, François Simard, and Yoann-Karl Whissell, Turbo Kid is a coming-of-age tale unfolding in a post-apocalyptic, retro-futuristic 1997. The synopsis mentions ‘an orphaned kid (Munro Chambers) sets out across the Wasteland on his BMX bike out to look for his best friend (Laurence Leboeuf) after she’s kidnapped by an evil warlord (Michael Ironside),’ but I’ll be the first to tell you that description barely scratches the surface of what lies in store for people who seek out this title. Simar and the Whissells have created an entire world that is undeniably familiar, but unquestionably alien at the same time. You can view trailer at the end of this post. Turbo Kid offers heaps of original ideas piled hight atop a peculiar and engaging premise, offering a vision of another reality we will sadly never be able to know ourselves. It’s a movie that exists in a sub-genre of film entirely its own, though it borrows heavily from far more mainstream science fiction fare, and even if you watch every other major indie oddity produced this year you would be unable to find another title that comes close to matching the absurd level of creativity on display in this feature. I know for a fact there will be some who simply don’t ‘get it,’ but for everyone else Turbo Kid will play like a breath of a fresh air, even if it drags from time to time. Some festival favorites takes years to reach mainstream audiences, but Epic Pictures has announced Turbo Kid will reach audiences on VOD and through limited theatrical release beginning August 28. Comment below and let us know your thoughts on the trailer.